The California Gold Rush began in 1848 after gold was found at Sutter's Mill in Coloma. The news brought more than 300,000 people into California, all of whom sought their fortunes in gold. Because the bulk of the first rush took place in 1849, the fortune hunters were called "forty-niners." They came from as far away as Australia and China. "Gold! Gold! Gold in the American River!" James Marshall, an American carpenter and sawmill operator, discovered gold on January 24, 1848 in the American River at Sutter's Mill in Northern California. 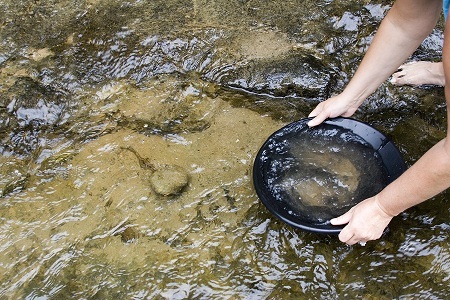 A native of New Jersey, Marshall oversaw construction and operation of the mill, and was examining the mill's water wheel in the the river bed when he noticed some sparkly flecks in the river bed. It turned out to be a pea-sized nugget of 23 karat gold. The nugget weight about 1/3 ounce and was appraised at $5.12. The mill owner was Johan Sutter, an immigrant from Switzerland. He tried to keep the discovery a secret, desiring to protect his agricultural business, but the secret was far too big to keep from the news. His hopes of building a town named "Sutterville" were dashed when squatters and prospectors overran his property and his agricultural workers left his employ to stake their claims in the gold fields. Thus, the city of Sacramento, which served as the major trading center in the region, was born. Coming on the heels of the Mexican-American War, the discovery at Sutter's Mill would soon cause a chain reaction which would propel California, a possession of Mexico, to American statehood, define its motto, "Eureka," and cause atrract than 300,000 people to the formerly remote and undeveloped territory. Those who sought gold in northern California were called "Forty-Niners," as that was the year the gold rush proper began, and more than a quarter million of them flooded the sparsely populated area, coming from as far away as Australia, Peru, Panama, and even China and had a hand in the birth of dozens of boom towns. The tiny settlement of San Francisco had almost 200 residents in 1846, mostly Christian missionaries and Indians. By the end of 1851, more than 36,000 people lived there. Roads, churches, general stores, schools, and saloons cropped up throughout California as boom towns were born, and in 1850, the now-rich state was added as part of the Compromise of 1850. Bodie, Stockton, Yreka, Placerville, and Monterey all popped up and became populated. Millionaires were born of the gold rush, including Levi Strauss, a fabric merchant who made his fortune sewing pants made from leftover tent canvas which he sold to miners miners. Mormon businessman Samuel Brannan became California's first millionaire. Brannan, a native of Maine, was a bigamist and an alcoholic, but a born public relations expert. He had arrived in San Francisco, along with 200 other Latter-day Saints less than 2 years prior to the Sutter's Mill find, and there he founded a newspaper. When that business began to fail, he moved north to Sutter's Fort where he was when gold was discovered. His store was the only one between San Francisco and the gold fields, so he gathered everything he could think of that a miner might need: picks, shovels, buckets, pans, tents, food, heavy clothing he could find and offered them at outrageously inflated prices. He promoted his new store in nearby San Francisco, waving a vial of gold flakes to the streets there, waving it above his head as he walked the streets, and shouting, "Gold! Gold! Gold in the American River!" He bought gold pans for $.20 apiece and sold them for $15 apiece. In the first nine weeks of the frenzy, he made more than $36,000. News accounts reported that the very day after Brannan's brazen advertising promotion, San Francisco became a temporary ghost town. In July, Governor Mason published the fact that many people had abandoned their families to travel to the American River, leaving them without food or means. Further, he proclaimed, many soldiers had deserted their posts in search of the precious metal. The area became famous for its lawlessness, and vigilantes were rife, trying to keep order among the influx of people. Native Americans who lived in the region were driven out of their homes by the 49ers. At the same time, the new west's economy blossomed. A plot of land in San Francisco which cost $16 in 1847 sold for $45,000 just a year and a half later. Theaters, shops, newspapers, and eateries sprung up. A cadre of new banks were founded and they exchanged gold for banknotes, and eventually, a mint was built there to create American coins. The peak of the gold production in California was 1853, with each subsequent year yielding less gold than the last one. Boom towns became ghost towns, and in 1859, many of the miners were heading toward Nevada after the discovery of the Comstock Lode, a silver strike found in the mountains of Nevada in what was then part of the Utah Territory. While some of the remaining miners went home, many stayed and became Californians. San Francisco was soon populated by thousands of miners who went there and other boom towns looking for work. In the end, those people who had left their homes in settled lands in 1849, whether by ship or by wagon train, and their descendants gravitated toward agricultural careers in California's warm climate, and this is what shaped California as we know it today. Displays the diary and letters home from a man who went west to find his fortune in the gold fields of California. He describes the trip from New York City, his employment at various jobs, and his construction of a house so he could send for his family. California's Untold Stories: Gold Rush! Hosted by the Oakland Museum of California, this website delves into the experience of being involved in the 1849 gold rush in California. It tells the story of gold fever, which overtook virtually everyone i the region, biographical exhibitions of those who were involved and their perspectives, and more tales from the gold mines. Traces the history of the Gold Rush of 1849, from the first discovery at Sutter's Mill, to the drastic influx of prospectors, to the boom towns. Also depicts life in the miners' camps. This website, which is hosted by the Sacramento Bee, the daily newspaper in the state capital of California, brings the gold rush to live for the reader. Articles abound about such things as Coloma's boom, religion in the mining camp, and what the miners ate, as well as an account of the competition among the newly-founded newspapers. Designed as a learning tool to go along with the PBS documentary of the Gold Rush, this website discusses the people and events of the rush, shows maps of the areas, and offers first-hand stories about the adventure. Search for Gold Rush on Google, Bing, or Yahoo!